It was originally in the August 1, 1989 edition of The Sun. CODED MICROCHIPS implanted in every person in the country would tie all of us into a master computer that could track anyone down at any moment, and plans for such a system are already under way whether you like it or not! The secret scheme is being touted as a service for the protection of the people by high government officials, but some insiders who object to the move say it's just another way for Big Brother to control its subjects. "Top-level national security agents are trying to convince sources in the Bush Administration to begin the project in which every man, woman and child will be implanted with a tiny transmitter," claims Davis Milerand, a critic of government intervention who says he has received leaked information from inside sources. "They're trying to say this will be a good way for authorities to quickly track down missing persons and children, as well as criminals and spies. "But with the astounding technology of today, everything about you could be contained in one tiny microchip, which would be connected to a government computer. "Any government agency will know what any person has done and is doing at any time." Other sources say the tiny transmitters can be injected painlessly from a tiny gun in humans without them even knowing it through a nationwide vaccination program. "All the government would have to do is make up something like the swine flu vaccine," Milerand says. "Imagine if they said there was a vaccine for AIDS. People would rush in droves to get shots. "The doctors themselves may not even know what they're injecting. They could be told the microchips are genetic implants that reprogram the body into fighting disease." He adds: "The program would require all federal, state and local government workers to undergo the injections. 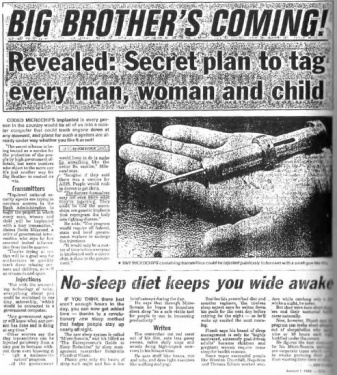 "It would only be a matter of time before everyone is implanted with a microchip, a slave to the government." Yikes to this and I for one hope this doesn't become reality. Wouldn't be surpise, spl if it becomes reality and etc.